Fine jewelry is beautiful, sentimental, and valuable. It’s something you can treasure for a lifetime— but also something that should be protected. While you can be mindful of where you wear your jewelry and when you take it off, life happens. Even the most careful jewelry owner is at risk of losing or damaging their jewelry. Or, worse, having it stolen. To protect the value of your jewelry, it’s always a good idea to purchase jewelry insurance. But how do you choose the right jewelry insurance? What’s the best jewelry insurance? In this post, we’ll walk you through everything you need to know about jewelry insurance. We’ll cover the four different ways you can insure your jewelry and list the pros and cons of each so you can decide which would be the best jewelry insurance for you. At the end of this post, we’ll also highlight a few of the most highly respected companies for jewelry insurance and give you some specific recommendations. Before we get into the specifics of jewelry insurance, let’s talk about the difference between insurance and warranties. It’s a common misconception that jewelry insurance and jewelry warranties are the same things. But this isn’t true. Jewelry sometimes comes with a warranty from the jewelry manufacturer that protects you from things like manufacturing defects. These warranties are commonly included with purchasing engagement rings, wedding rings, diamond rings, and other luxury pieces. Or if a warranty doesn’t come with a piece of jewelry, it can sometimes be purchased alongside it. But most jewelry warranties are very limited and should not be confused about insurance. They usually only cover manufacturing defects and do not cover things like accidental damage, loss, or theft, which is what jewelry insurance is for. So, don’t make the common mistake of thinking a jewelry warranty will protect the value of your jewelry. RockHer offers an extensive lifetime warranty (learn more here) for everything we sell, but we cannot protect you from life, things happen so it's best to stay protected with insurance. Now, let’s talk about the four different ways you can insure your jewelry. There are four categories of insurance that can cover jewelry: a home insurance policy, a home insurance policy with jewelry insured as scheduled personal property, a personal article property insurance policy, and specialized jewelry insurance. Let’s take a look at what each of these can cover and take a closer look at the pros and cons of each type of insurance. A home insurance policy is one of the easiest ways to insure your jewelry. However, a homeowner’s insurance policy also tends to cover the least and can come with many caveats. The same can be said for a renter’s policy, which will usually have the same type of coverage as homeowner’s insurance. Standard homeowner’s insurance usually covers the theft of your personal property, which includes your jewelry. But it generally only covers theft and not lost or accidental damage. Additionally, standard homeowner’s insurance policy will likely have a cap on the amount your insurance company will reimburse for specific categories of property. This can be an overall limit for the category but can also include per item limits within that category. There’s also the issue of deductibles. Many home insurance policies require you to meet a deductible, which means you’ll have to meet your deductible before you receive any money from a claim. Commonly, within a homeowner’s insurance policy, jewelry has coverage of limit of around $1,000 to $2,500. So, say your insurance has a per item coverage limit of 2,000 for jewelry and your engagement ring worth $6,000 is stolen from your home. You also have a deductible of $1,000. 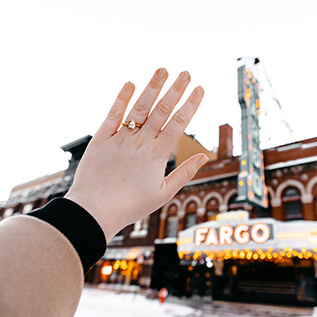 The maximum amount you’ll receive for your engagement ring insurance would be the maximum coverage limit minus your deductible. That’s 2,000 minus 1,000. So you would only receive $1,000, causing you to lose $5,000 of your stolen jewelry’s actual cash value. With home insurance, there’s also the possibility of an overall home insurance premium increase if you do claim the theft of your jewelry. It’s clear that while a general home insurance policy does offer you some protection against theft, it doesn’t provide comprehensive coverage. However, there is a way to improve your jewelry coverage benefits with a home insurance policy: to insure your jewelry as scheduled personal property, which we’ll cover next. If you want to ensure a piece of jewelry is fully covered by your home insurance policy, you can insure it as scheduled personal property. Scheduled personal property coverage is an optional add-on to homeowner’s insurance. This type of coverage usually doesn’t have a deductible or a coverage limit, which means you would receive the full replacement value of your insured item. 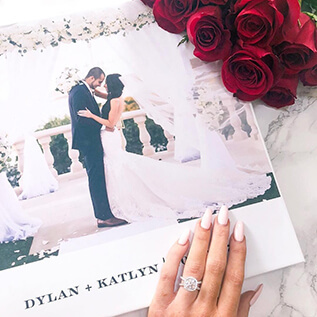 In the case of the $6,000 engagement ring we used as an example in the last section, you would receive its full value amount of $6,000 if they were insured as scheduled personal property. Scheduled personal property has another advantage: it usually also covers loss and damage of your property (in this case, loss or damage of your jewelry) in addition to theft. Scheduled personal property still does not cover wear and tear, but the addition of loss and damage protection is a step up from standard home insurance coverage. There are a few caveats to mention about scheduled personal property, however. First, this add on will come with a higher premium. The cost of your premium will increase based on the value of your scheduled personal property item. However, you will have the assurance that you’ll receive your item’s full value if you do need to make a claim. So, many people may find a higher premium is worth it for the peace of mind in knowing their jewelry’s value is protected. Another potential drawback of scheduled personal property insurance is what may be hidden in the fine print. For one thing, home insurance, in general, doesn’t usually cover loss or damage due to floods or earthquakes. Also, notably, there’s a common clause in many scheduled personal property contracts called the “mysterious disappearance” clause. Many home insurance companies have a clause that can affect your coverage if a claimed item has “mysteriously disappeared,” meaning the cause of your missing property is unclear. If you’re considering insuring your jewelry as scheduled personal property, it’s important to take a close look at the perils and exclusions section of any policy to understand exactly what it does and does not cover. A personal articles policy is a special policy offered by some insurers. This type of policy is not connected to your homeowner's insurance, even if you happen to purchase it from the same company you have homeowner's insurance with. While this means you will have to set up a separate policy, it also means your homeowner's insurance premium will be unaffected if you need to make a claim on your personal articles policy. A personal articles policy is a stand-alone policy that can cover a single item or a group of items. It can cover things like electronics, musical instruments, fine art, and, of course, jewelry. It can cover a single piece of jewelry like an engagement ring or a collection of other jewelry. To get a personal articles policy for jewelry, you’ll need to provide your insurer with recent proof of purchase or an appraisal. If your jewelry is older, vintage, or antique, an appraisal would be your only option. However, we would generally recommend providing an appraisal for all jewelry, even if you just purchased it, as appraisals provide a more detailed description for your insurer, which can help you be better protected if you end up needing to make a claim. If you don’t know where to get your jewelry appraised, the American Gem Society has an easy-to-use tool on their website which you can use to find an appraiser in your area. Most personal articles policies cover the full value of your insured item(s). These policies also usually do not come with a deductible, though they do occasionally, so always check a policy’s terms before committing. Additionally, personal articles policies generally have more robust coverage than home insurance policies and often include coverage for losses incurred from floods or earthquakes. Confusingly, personal articles policies can go by different names. These policies can sometimes also be called “inland marine insurance” or a “personal articles floater.” While inland marine insurance is almost always just another term for a personal articles policy, a personal articles floater is a term that is used for both personal article policies and scheduled personal property insurance. If you’re looking at a policy called “personal articles floater,” be sure to check to see which kind of policy you’re actually getting. Our last type of insurance is one that was designed specifically for jewelry: specialized jewelry insurance. A specialized jewelry insurance policy is often the best way to get the most coverage for your jewelry. Since this type of insurance was created specifically for jewelry, it will usually fully cover common issues such as damage, loss, and theft. Stand-alone jewelry insurance also generally doesn’t come saddled with the same exclusions as home insurance policies, such as flood or earthquake exclusions. 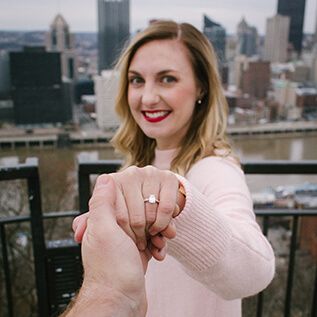 Here at RockHer we have partnered up with the largest jewelry insurer worldwide, Jewelers Mutual Insurance, they specialize in jewelry specific insurance, which makes them less expensive with more coverage. Did you already purchase from us and miss the opportunity? No worries click this link to apply! These policies usually cover all common risks associated with owning your piece of jewelry. However, not all specialized jewelry policies are created equally— you should always check the fine print on any policy before selecting it. But there are many excellent specialized jewelry insurance policies that can cover much more than other insurance policies. There are specialized insurance policies that have very few holes in coverage and will even cover “mysterious disappearance” loss. To get a specialized jewelry insurance policy, you’ll need either an appraisal or a recent detailed receipt. As we said in an earlier section, we always recommend getting an appraisal, even for recently purchased jewelry, as this usually offers better protection of the true value of your jewelry. An appraisal is necessary for determining your jewelry’s value when you get specialized jewelry insurance. But it’s also a good idea to get regular appraisals and update your policy as time goes on. The value of gold, diamonds, and gemstones can vary widely year by year. Vintage jewelry can also change value significantly over the years (this is particularly true for rare vintage watches). So it’s important to have your jewelry regularly appraised to ensure its value is properly protected by your policy. As a general rule, we recommend re-appraising your jewelry every 2 to 3 years and changing your insurance policy accordingly. Additionally, your particular insurance policy may have specific rules for regular appraisals, which is something you should keep in mind when selecting your policy. If you have high-value jewelry that you don’t often wear (for example, an inherited luxury watch or diamond necklace), you can often get a discount on your specialized insurance policy premium if you store that jewelry in a bank vault. High-value jewelry will be more expensive to insure, as insurance premiums are based on a percentage amount of the value of your jewelry. But if you have jewelry you never or rarely wear, storing it in a bank vault can reduce this cost, as insurers will consider your jewelry less at risk. With these types of discounts, you sometimes have to give notice to your insurance company if you plan on taking your jewelry out of its vault to wear it. And you may also need to prove that you have a bank vault. Still, if you rarely wear a particular piece of jewelry, the small inconvenience of notifying your insurance company of your jewelry’s whereabouts can be well worth it if your jewelry would otherwise have a very high premium. Now that we’ve covered the pros and cons of each type of insurance, we’ll highlight some of the most commonly used insurance companies for insuring your jewelry. Among jewelry specialty insurance companies Jeweler’s Mutual, Lavalier, and Jibna are three of the most well-known and reputable. Notably, GEICO has a partnership with Jeweler’s Mutual so you could purchase a Jeweler’s Mutual policy a GEICO insurance agent as well. Also of note, Lavalier is partnered with a number of local jewelers so you may be able to purchase a Lavalier policy through your jeweler. 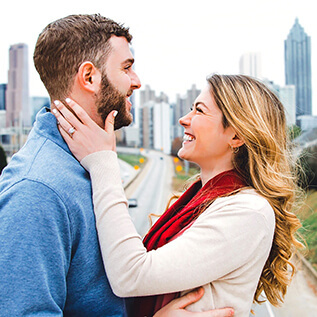 Jibna doesn’t have any current partnerships but they are well respected and are the only insurance company that specializes solely in personal jewelry insurance. If you want to insure through a personal articles policy, State Farm is an excellent option. Nationwide is a good option for jewelry insurance through a homeowner’s policy and also offers a unique jewelry policy add-on option for jewelry collections valued at over $25,000. Another great option for jewelry item insurance is Chubb, a company that occupies a unique space in the insurance world. Chubb specializes in premium insurance policies, which can cover many valuable items, from yachts to artwork to jewelry. When it comes to jewelry insurance, the most important thing is choosing a policy that’s right for you. As we’ve detailed in this post, these different types of insurance come with different types of coverage. 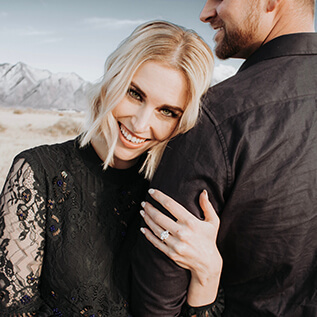 If you’re still unsure which would be the best jewelry insurance for you, consider what kind of coverage you need to feel the value of your jewelry is protected. If you’re comfortable with less protection or if your jewelry is of a lower value, you might love the convenience of a general homeowner’s insurance policy. If you want more a bit more protection, insuring your jewelry as scheduled personal property could be right for you. And if you want the most protection, go with a personal articles policy or a dedicated jewelry insurance policy.